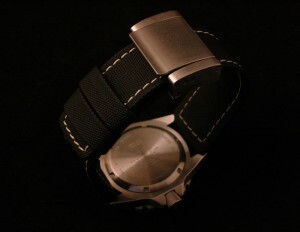 The McBob vs. Divestraps/Ted (Mc)Su “Kevlar” Straps – I Already Have a Watch. UPDATE: Recent testing has confirmed there is absolutely no Kevlar® content in Divestraps.com straps. Divestraps "Kevlar" Strap with steel cam buckle. Watch collecting can be a weird sort of hobby. Though technical and horological accomplishments would ostensibly be among the most desirable qualities in watches, despite our most well-intentioned attempts at objectivity our emotion, sentimentality and subjectivity are almost inseparable from the opinions we form. Manufacturers and sellers are of course well aware of this and are quick to shamelessly capitalize upon it, obfuscating reality here and there with just enough deception and half-truth needed to make a quick buck off of us enthusiasts. So it can be pleasing in a way to see one of these blatantly exploitative abusers exposed. Especially one who goes by the name “Outstretchedhands” — as in hands outstretched for your money! A little over a year or so ago Duncan “Outstrestchedhands” McMorrin (owner of divestraps.com) began touting straps he termed “Kevlar” straps. His posts annoyed many forum readers, especially when started shilling them first in discussion forums with photos describing them as the “ultimate” dive strap and other hyperbole with some (admittedly) beautiful photos shortly before offering them for sale. It didn’t help that they were paired with a garishly outsized cam type buckle whose size and dimensions would make its wear in real-world situations highly impractical, and then later with Panerai-knockoff buckles. It didn’t help that he insisted upon referring to them as “the Ted Su Kevlar Dive Strap” (who’s Ted Su?) and then later, bizarrely, “Ted McSu” – presumably of the Highlander McSus? Related to the McHuangs I wonder? A few months later some very serious doubts emerged concerning the honesty and transparency of his description, namely whether or not they were actually Kevlar® at all. Duncan stuck to his guns, maintaining adamantly on numerous occasions though offering no proof that the straps were indeed Kevlar despite the doubts, derisively dismissing critics as internet kooks with axes to grind. The word “kevlar” (lowercase ‘k’) gets used frequently but improperly to refer to all sorts of products, designs, and materials. The original Kevlar® (uppercase ‘K’) of course refers exclusively to the trademarked DuPont brandname for the para-aramid fiber developed in the 1960s. Though the original patent has expired and similar fibers can now be made by any manufacturer, even referring to them as “kevlar” (lowecase ‘k’) is still an improper use of the registered, trademarked brand name despite the frequent (mis-)use among sellers and marketers. Many makers even refer such materials as “Coramid” or such to avoid trademark infringement, at least when it actually contains a para-aramid fiber similar to DuPont’s Kevlar. Despite its “bulletproof” mystique and high strength-to-weight ratio (roughly 5 times stronger than steel on an equal weight basis), Kevlar can be a temperamental fiber to work with in finished products and textiles and is not without vulnerabilities. Kevlar is susceptible to breakdown from ultraviolet light exposure and long-term water exposure or repeated washings, especially if the design of the finished product does not “seal” the Kevlar fibers well through lamination or other means. So Kevlar is far from an ideal material for use in dive straps at all with its susceptibility to degradation from water exposure. Ironically, if Duncan “Outstretchedhands” McMorrin’s straps had actually contained Kevlar as stated they might even be less suitable for their supposed application! All else aside, the straps themselves aren’t too bad in and of their own right. Decent construction, well-made and likely durable enough, but just not Kevlar® or even kevlar. Another possible shortcoming is the one-size-fits-all approach to sizing: the uniform 24mm width has to have notches cut in the lug ends to fit the more common 22mm and 20mm lug sizes on most watches, which can lead to a somewhat unfinished appearance especially with the large cutouts required on a watch with thick 20mm lugs. Oddly, Outstretchedhands/divestraps.com also ships his without holes punched unless explicitly requested, perhaps because they were originally shipped with the outrageously sized tongue buckle. And of course the typical end user would likely be quite challenged to punch holes in a strap that was actually made of Kevlar®. Last week Bob of Broadarrow.net began offering what for all the world appear to be identical straps for $20, apparently sourced from the same supplier [EDIT: please see addition below regarding sources] complete with a deliberately infomercial-esque spoof description. Based on the ridiculous “Ted McSu” designer name of the others, these seem well on their way to becoming known as the “McBob” strap. Attentive readers will note as well that that the description explicitly states ” Contains no Kevlar™” despite all of Outstretchedhands’ prior protestations to the contrary. 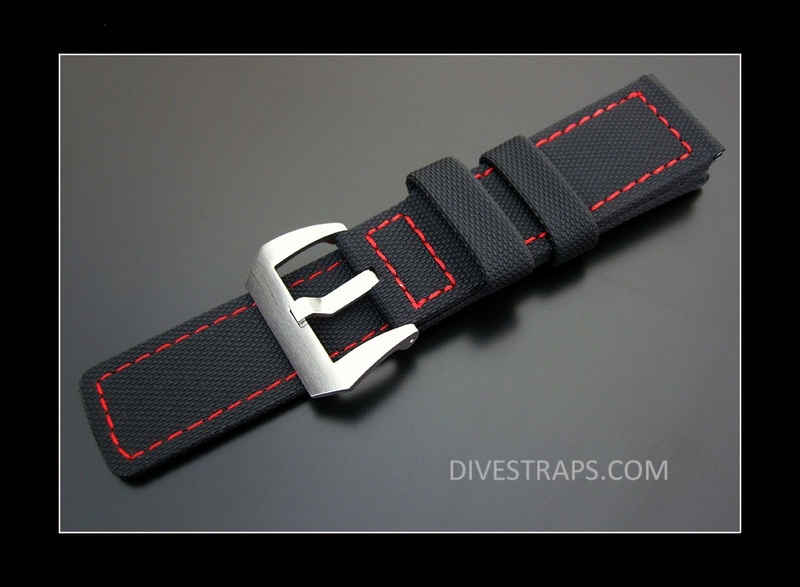 Dive straps sold by Outstretchedhands as "Kevlar" for $130 and up. Not even holes for the buckle tang. Maratac Elite Series strap, identical construction but clearly and honestly described as 'contains no Kevlar' for $20. Holes included. I wonder how Outstretchedhands’ customers will feel when they realize they’ve been overpaying by a factor of more than 700% for a strap that’s not what is was advertised to be at all? Tagged with divestraps, kevlar, Military Watches, outstretchedhands, Straps, ted mcsu, ted su. Ha. Good to see this dicktard exposed. Just wish I had waited for the $20. version to buy one. Way to Sock it to ’em! Always good to see (mis)truth in advertising exposed. Not commenting on the associated price quibbles, but your assertion that they are identical is simply not true. Sans the goofy buckle they *are* identical, and neither has any kevlar. Ha. I hadn’t even noticed the spoof “wow” description on Bob’s page before reading this, nor had I ever heard of Ted McSu (or if I had, I didn’t pay any attention). You’re absolutely right, there’s a lot of deception and emotion injected into this hobby, thanks for shedding light on this particular instance. How is the identicality simply not true, Sebastian? I call bullsh*t on you. There is a simple way to end this controversy immediately. Offer to have a sample tested. Real Kevlar ™ is tough as nails and it hard to cut. It is also very highly resistant to flame. The latest from the forums. To be honest, he’s not exactly sure what the divestraps are constructed of. He has never asked his supplier. And he most certainly has no idea what Bob’s are made of, but do not confuse the two, they most assuredly are not the same! Would not surprise me if the construction (except for the buckle) was identical. Imagine that, a $110 buckle. Duncan, you are on a slippery slope here and, if I were you, I’d fold up the strap business and be satisfied with all the money made so far by taking advantage of the trust of the internet watch community and spinning it shamelessly on its head to make a whole whack of money per unit. We all need to make a living and your profits are your business but when shilling, deception and gouging are involved I think this is where all of us draw the line. The more you try to differentiate your straps from the Maratac straps (both of which clearly come from the same Chinese based supplier), the further you are slipping down that slope. Cut your losses and fold, otherwise it’s going to be an unnecessarily bumpy ride for you in terms of time and energy: this fight is not ‘the good fight’. I’ve had both, they are not the same. The dive strap version a a wee bit thicker and stiffer, the maratac is softer. Still I would not blow $130 for fake kevlar. Love the maratac! can be be that Outstrecthedhands got done by Tedsu ? be4 the maratac everyone was saying how great Tedsu ‘kevlar’ is. Maybe even Tedsu got dubed by the factory. Yes, I think it’s quite possible Outstretchedhands was duped by the wholesaler/importer/manufacturer. I’ve alluded to it in a follow-up post. But there have been serious questions raised for months, to which his only response was to deny outright and continue advertising and selling them as such. He’s just now *starting* to look into something he should have investigated a long time ago. exclusively to the para-aramid fiber products made by DuPont. Sorry Rrryan, you are wrong about the comparison. As someone who has purchased the Ted Su straps and now has 2 of the new Maratac straps, I can tell you that the Maratac straps are lower quality. They do appear to be similar upon initial comparison, but the Ted Su are thicker and better made. The Maratac feel cheap, which at $20 they are. The Ted Su are expensive and you could debate all day as to whether they are worth the price, but you are not getting the same quality for the $20 spent on the Maratac. You really should have purchased both and made a fair comparison before attacking “Outstretched Hands.” Just my $0.02 worth. Thanks for the comment Mike, but what is wrong with the comparison? Since you have both, can you tell us whether or not they contain Kevlar? As an owner of both, can you point out any differences to us that might not be apparent to us from examining the photos above? What am I missing? I don’t meant to single you out, Mike, but all these sweeping “You’re wrong” generalizations that are wholly dependent on subjective determinations that have been pouring in though the comments and email are getting tedious. 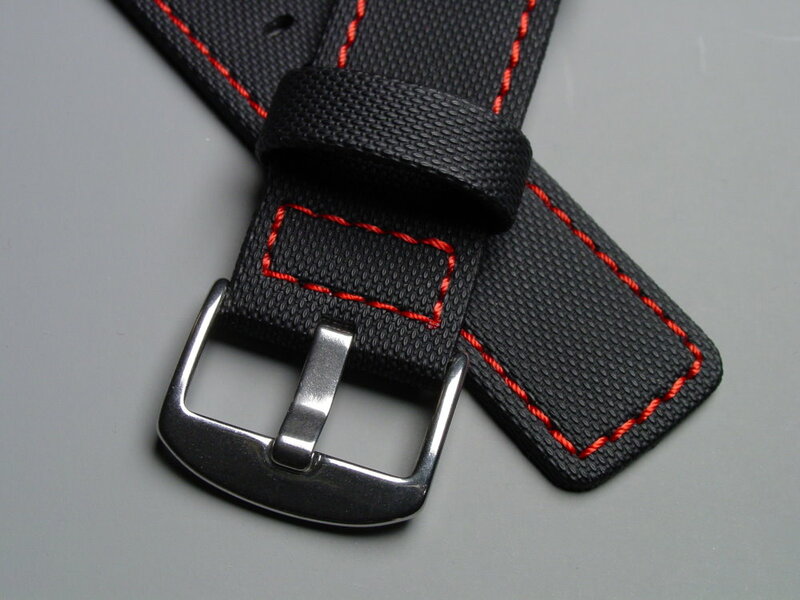 Prove it: identify and point out specific differences that make these straps substantively different. The actual Kevlar content of the straps is not subjective. Our friend Overstretched has a shady past in his internet dealings,just google Minox and you might find his desciptions of what he sells more than a little dodgy. reference value for future victims. each other. This, of course, perpetrates the scam. and I wasn’t even trying to search. donations for a nonexistent charity, to finance his flying lessons. clearly shows him both asking and answering the same questions. with this in the states. > spread and we can save more people in the future. Very interesting, thanks for sharing. And somehow I’m just not all that surprised. Hard to believe that yet another person would try selling the same straps at this point in time (and for $90!?!?!?!). Perhaps I should start selling (Mc)Bob’s for $60 to undercut them? FWIW, I think the money would be better spent on a watchmaking course. duncan mcmorrin is actually used as the example of ebay fraud. Duncan just posted on the WUS dive forum. Why, you ask? To remind everyone that he works for a charity dealing with “disaffected children” and that 99% of his customers are pleased with the straps. As such, I have decided to start a petition to nominate him for the Nobel Peace prize. He really deserves it. He’s known to have used such buying and selling tactics in Spain about five years ago. but perhaps he pleases those sad once in a blue moon divers that want to beleive they are getting something cheap but special to brag about!